Crazy Room Escape is an escape game made by Halicon Mobile. In Crazy Room Escape you find yourself trapped in different rooms and you must find a way to get out of them. You will have to search for useful items, solve challenging puzzles and follow clues in order to find a way out of the room. If you can't find the way to get out of the room in Level 5 the walkthrough below will help you accomplish this. Yellow - turn the switch under the table and the light will turn on. There are 7 lights on the lamp. Tap the code panel on the table and enter: 8 1 7. Inside you will find 6 squares connected with arrows. Inside you will find a note with this: "03#3246*8157"
Now enter the code "03#3246*8157" on the keypad to open the door, and escape this crazy room. Crazy Room Escape Level 5 Answer, Cheats, Solution for Android, iPhone, iPad, iPod. Note: This is "Crazy Room Escape" by "Halicon Mobile"
Crazy Room Escape is an escape game made by Halicon Mobile. In Crazy Room Escape you find yourself trapped in different rooms and you must find a way to get out of them. You will have to search for useful items, solve challenging puzzles and follow clues in order to find a way out of the room. If you can't find the way to get out of the room in Level 4 the walkthrough below will help you accomplish this. Look at the 3 bottles near the right wall. They tell you how to adjust the clock. Tap the clock above the door and set it to the time showed by the bottles. You will get "07:20:50". Now tap the drawer on the desk and enter the time: "07:20:50" to open it. Inside you will find a box with 4 black squares buttons on it. Inside you will find a power cord. Plug it in the outlet behind the chair. 3 small buttons will be on now: "YELLOW - RED - GREEN". The door is now open, and you can escape this crazy room. Crazy Room Escape Level 4 Answer, Cheats, Solution for Android, iPhone, iPad, iPod. 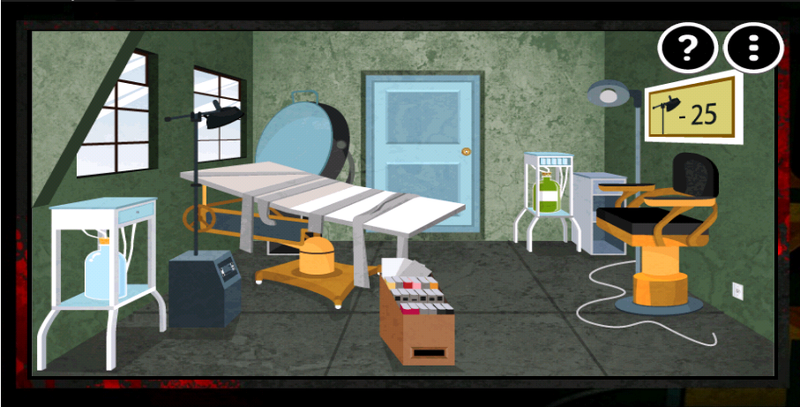 Crazy Room Escape is an escape game made by Halicon Mobile. In Crazy Room Escape you find yourself trapped in different rooms and you must find a way to get out of them. You will have to search for useful items, solve challenging puzzles and follow clues in order to find a way out of the room. If you can't find the way to get out of the room in Level 3 the walkthrough below will help you accomplish this. Under the bed there is a purple coin. Look to the painting on the wall and remember the colors order. Now look a the books, do the math and put the results in the order given by the colors on the picture. You will get this code: "9386". Tap the drawer under the bed and use the code (9386) to open it. Inside you will find a golden key. The compartment is now open, and inside you will find a blue coin. Tap on the window to see the order of the coins: "BLUE - YELLOW - PURPLE". Tap the green cabinet and insert the coins in the golden slot, in the order shown above. A door will open on the cabinet and inside you will find a key-card. Tap the door, enter the key-card, and you can now escape the room. Crazy Room Escape Level 3 Answer, Cheats, Solution for Android, iPhone, iPad, iPod. Crazy Room Escape is an escape game made by Halicon Mobile. In Crazy Room Escape you find yourself trapped in different rooms and you must find a way to get out of them. You will have to search for useful items, solve challenging puzzles and follow clues in order to find a way out of the room. If you can't find the way to get out of the room in Level 2 the walkthrough below will help you accomplish this. Tap the table and take the USB wire. Plug the wire into the power outlet near the door. Observe how the light flashes: "ORANGE - GREEN - GREEN - ORANGE - GREEN - ORANGE". Tap the picture on the wall, and tilt the corners in to order given by the colors above. In side you will find a pink box with some symbols on it. Take the orange cloth that's hanging on the wall near the door. Use the cloth on the water bowl near the door. Take it back, and use it to clean the window. Now some symbols will be revealed on the window. Use the symbols on the window to open the pink box. Inside you will find a golden key. Use the golden key to open the lock on the door. Tap the table on the right side and observe the arrows and the order of rotation: "RIGHT- LEFT - RIGHT - LEFT". Use this to on the buttons that are under the water bowl. Tap the buttons in this order: "LEFT - RIGHT - LEFT - RIGHT. The drawer will open and you will find a hammer inside. Use the hammer to break the door and escape this room. Crazy Room Escape Level 2 Answer, Cheats, Solution for Android, iPhone, iPad, iPod. Crazy Room Escape is an escape game made by Halicon Mobile. In Crazy Room Escape you find yourself trapped in different rooms and you must find a way to get out of them. You will have to search for useful items, solve challenging puzzles and follow clues in order to find a way out of the room. If you can't find the way to get out of the room in Level 1 the walkthrough below will help you accomplish this. Look on the black rectangles that are on the books inside the box that's laying on the floor. Go on the small table near the door and make the rectangles as they are drawn on the books. Inside you will find a small knob. Use the knob to open the drawer of the cabinet on the left wall. Inside you will find 2 batteries. Insert the batteries on the small black console. Tap the light above the bed to turn it on and reveal a code: "1987". The painting on the right wall, shows a lamp and "-25". So you have to do the math: "1987 - 25 = 1962". Tap the bottom part of the book box, and enter the code: 1962. A drawer will open and you will find inside a white wire. Connect the wire on the chair near the right wall, and plug it in the power outlet. Now tap the lamp near the chair, and count how many times it flashes (5 times). Tap the door and press the light button 5 times, and the door will open, and you can escape this room. Crazy Room Escape Level 1 Answer, Cheats, Solution for Android, iPhone, iPad, iPod. Crazy Room Escape is an escape game made by Halicon Mobile. In Crazy Room Escape you find yourself trapped in different rooms and you must find a way to get out of them. You will have to search for useful items, solve challenging puzzles and follow clues in order to find a way out of the room. If you can't find the way to get out of the room in one of the levels choose the level below and you will see a complete walkthrough on how to solve it.